Ian is mounted on Rosie's stern. 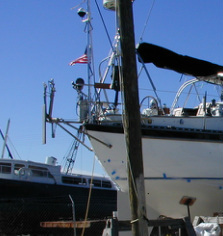 If we are off course and Rosie is to port of her target line then more of the wind vane is exposed to the wind and it is blown to port also.This in turn causes the blade in the water to go one way or the other which in turn will pull one of the two lines at the steering wheel.Make sure that the line that is being pulled goes to the top of the wheel hence pulling the wheel to stbd and hence getting Rosie back on course.When using Ian we normally use Bob to hold the course we want then adjust the vane so it is straight up and down then we set Bob in Standby and engage the pin in the steering wheel. It normally takes 5 minutes of adjusting where the pin goes before I am happy with the course. After that course adjustments are made by moving the vane. Use the procedure above to mentally work out which way you want to move the vane. The way I currently have it set up is pulling on the bottom of the vane turning rope turns Rosie to the stbd. The boat should be perfectly in balance before attempting to use Ian i.e. the center of the wheel should be pretty much in the centerAny changes in wind conditions will result in having to re-trim IanThere is a high wind paddle (i.e. smaller) in the pilot berth however we have never had cause to use it, the big one does fine in all but light conditions. We have a tiller style Autohelm that connects to Ian to allow for a compass course to be steered rather than a wind angle. This is a good backup for Bob, also a good backup if power is an issue as it uses much less power than Bob.